self-assessing thinkers? With this classroom-friendly guide, youll become a better teacher as you learn to assess students before, during, and after instruction. 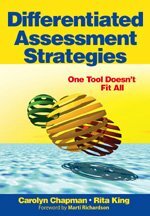 Packed with tools, surveys, checklists, questionnaires, assignments, organizers, guidelines, and rubrics, Differentiated Assessment Strategies addresses informal as well as formal assessments, and assessments before, during, and after learning for learners of all types and levels, including K-12, special needs, and gifted students. In addition to application of the latest research, youll become skilled in novel assessment tools that provide immediate feedback. Chapman and King provide ready-to-use tools to: Evaluate and activate students prior knowledge Transform homework into rich learning opportunities Draw higher order thinking from ALL students Assess learning to offer feedback to students Assess learner preferences, as well as cognitive styles and multiple intelligences Determine student comprehension and requirements for reteaching Build students' metacognitive power to self-assess their own learning Use assessment strategies to build a positive learning culture and energize your students! Carolyn Chapman is an international educational consultant, author, and teacher who has taught in kindergarten to college classrooms. Her interactive, hands-on professional development training sessions challenge educators to use strategies that ensure success for learners of all ages. Carolyn has written many books about differentiated instruction, multiple intelligences, multiple assessments, and the brain-compatible classroom. She is co-author with Gayle Gregory of the landmark Corwin book Differentiated Instructional Strategies: One Size Doesn't Fit All. Differentiated Instructional Strategies for Writing in the Content Areas, and Differentiated Assessment Strategies: One Tool Doesn't Fit All.